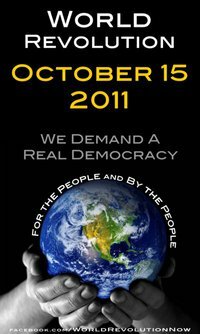 I recently received an invite on Facebook for a very special event : the “World Revolution for Real Democracy“, which is scheduled for October 15th this year. The aim of the event is as vague as it sounds great: demanding a real democracy. Reading that, my thought is : how can you ask for democracy and who to ?, democracy is not something that somebody would have stocked up somewhere and who would say “here, have some” when asked. As people in Tunisia, Egypt, Libya, Syria can testify, democracy is not an easy thing to obtain and asking for it is not often a good way to get it. Moreover, it is stupid to think that democracy can come globally – however universal the concept is, the path to democracy is different in every country, every culture, … A global event for democracy is therefore not the appropriate idea. For those reasons – among others – I do believe that next October 15th will be overall a very quiet day with not much to remember. As I live in Tokyo,how I can contact the person who organize this movement.